My brother and his wonderful family were out this past holiday week and we had so much fun! One of our favorite activities was watching movies on the barn. The old Victorian couch was my Great Grandmother's. It used to be in our play room when we were kids (also my Dad's childhood room). We hauled it out of storage (from the barn) for movie viewing under the stars. Here's part of the gang just before pancake breakfast - my nephew Nathan, my nieces Lauren and Katie, and my Mom with Graham. My sister-in-law Marna and I (with baby Margaret) are reflected in the mirror. Very sweet. Love the film night idea. I am really keen to get a projector so we can do some outdoor movies! What fun, looks like you had perfect weather for watching movies unders the stars. What a lovely past time. Im sure the kids would have loved it out under the stars!! I love the couch in front of the barn, and your dining room is so beautiful. Have a lovely week. I love that you always create beauty for others to share. What lovely house guests! Love the outdoor movie idea. I adore the idea of the couch to watch movies!! Fabulous! I just love your blog. 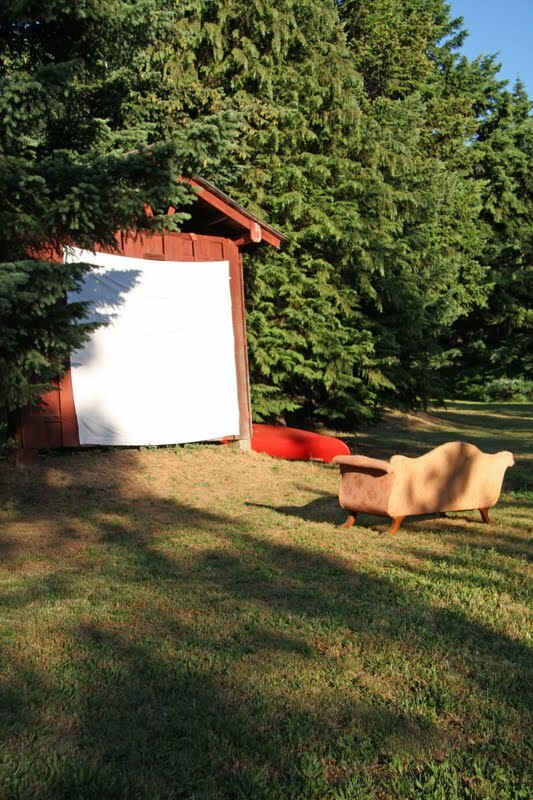 What a neat idea with family, watching movies outside on your barn. Come visit my blog at chestercountycottagegirl.blogspot.com. Love the photo of your family sitting at farmtable waiting for their breakfast. How TOTALLY charming is it to set up a sofa outside, put a blanket on the barn and create your own little movie theater under the stars. I suppose you made popcorn on nearby campfire? S.
Outdoor movies, what a great idea!!! Oh fun! Pancake breakfasts and watching movies under the stars.....simply wonderful! Glad you had a special holiday with your family! Can't stand how wonderful this photo issss, MORE! What a fun idea! Movies on a barn. You done good. I love outdoor movies! How fun to have your whole family visit for the holiday! Oh what a dreamy evening. I bet the kids enjoyed it as much as the adults. I absolutely love that sofa...do something with it for the inside !!!!!! What fun! Love the idea of watching movies under the stars!! I loved finding you and Margaret in the mirror! Movies under the stars, and family visiting. You are so lucky! Love it!!! What a special time everyone had...the kids looks so happy, they must have been thrilled to watch movies outdoors...too fun! everyone looks so Happy....love baby margaret...how sweet is she ??? love the barn and the couch photo...what good SUMMER FUN !!!! It sounds like you had a blast, and to watch a movie outside against the barn under the stars would be exciting. It looks like everyone was having a great time by the photo. Such a sweet picture. I love outside movie night! And, what a beautiful family! This looks like so much fun. I'm immediately transported to relaxing summer evening after reading this! how fun!! Imagine the fabulous summer vacation memories you have given to your cute nieces and nephew- what a sweet gift! So happy you all had a wonderful visit! that photo is just the sweetest! it's so nice to see your beautiful home full of people! i bet they are all head over heels for the twins. and movie night outside? heaven. An outside movie against a barn - perfect. Love your blog. Such a wonderful way to watch a movie with the family! I have, at times, been guilty of looking at Real Estate for Sale in Upstate NY ... I will now pay special attention to those homes that also have barns or sheds .. this looks like the most fun idea ! Very appealing to me .. and I know my husband will love it. Something I've always wanted to do! I'll bet the kids had a blast! I adore this whole post. 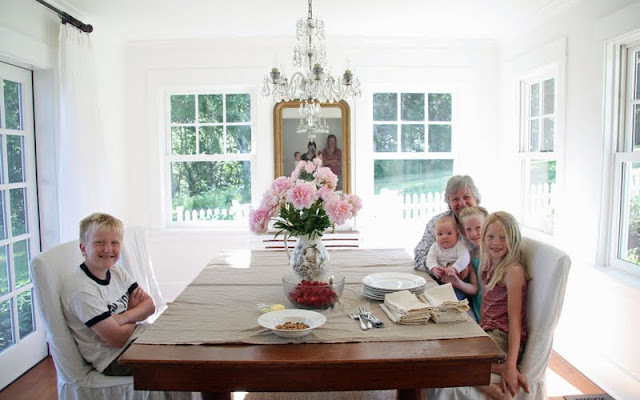 The movie setting and the family table with the mirror is all so peaceful and wonderful. Those babies make my day! What a lovely family and great photo! Your home is so bright...I LOVE IT! New follower - looking forward to catching up with your blog. So fun! What a lovely blog you have, I just popped in through a link in another Finnish blog. Your many subjects and stories, wonderful home and garden made a pleasant read for a long while. Best wishes and all the best! it's so fun having family out to visit! we love to watch movies outside. we also like to play the WII...we love american idol! thanks for sharing! What happy memories you are making! Watching movies outdoors on a barn door, in a comfy sofa under the stars...does it get any better than that? I adore this photo, great room, lots of light and a wonderful family. What fun!! Nothing is more wonderful than creating memorable times with your family! How fun to have your family visit! Great, creative idea to show movies on the barn. what a great time you all must have had. That was a fun idea. We haven't tried watching at the barn.. would like to try it with my kids at the backyard..
What a great photo. You all look so sweet and that pancake breakfast sounds so great!! LOVE the shot of the sofa on the grass, Trina! Hope you are enjoying this glorious summer we are having! Like your very own drive in movie! How fun for all of you. How much fun! What a great idea!!! What a sweet photo of the family. Can't get enough of your sun (and love) filled home!